Known as the City of Monuments for its jaw-dropping skyline of ancient ruins, magnificent towers, and stunning sculptures, Magnimar embodies the spirit of the frontier realm of Varisia more than any other city. This is a breakout SoundSet from a Pathfinder Adventure Path SoundPack. Subscribers automatically gain ownership of this SoundSet. 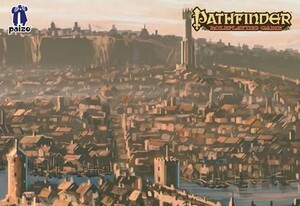 Magnimar (big city) SoundSet © 2015 Paizo Inc. Paizo Inc., the Paizo golem logo, Pathfinder, and Pathfinder Adventure Path are trademarks of Paizo Inc. Sounds created under license with Paizo Inc.